Last year, I met a talented wildlife and nature photographer, Ernie Sears, while touring and photographing Featherstone Wildlife Management Area. and, since then, we have had other opportunities to shoot together. On Friday, Ernie stood up a new Website dedicated to displaying his and other other photographers’s American bird photographs. Ernie asked that I contribute some of my bird photographs to the Website, which I gladly did, and I was honored when he asked me to be the site’s first featured bird photographer. Also included on the the American Wild Bird site is an article I wrote (Photographing Sandhill Cranes in Florida) on my memorable experience shooting Sandhill Cranes at Paynes Prairie Preserve State Park in 2008, when over 5,000 cranes were wintering there. If you enjoy seeing bird photographs and reading about them or a photographer’s experience in photographing them, I encourage you to visit AmericanWildBird.com, or if you are a bird photographer I recommend sharing your photographs on this site. 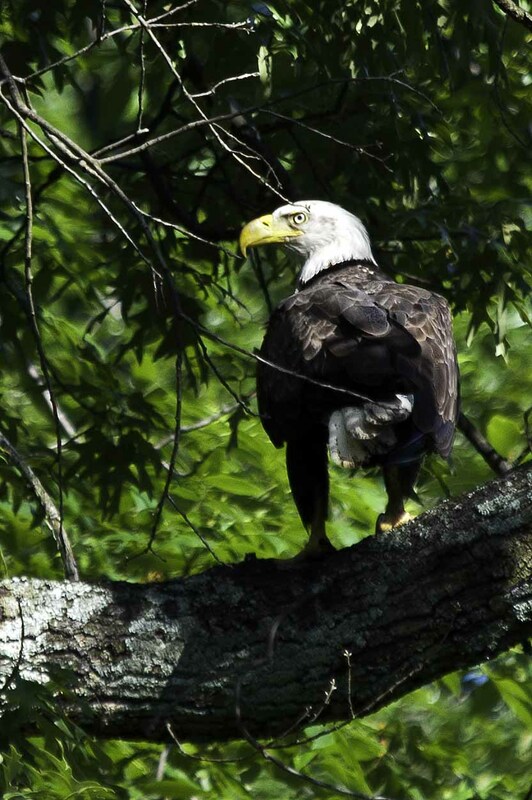 To “spice up” this article, below is photograph that I shot yesterday at Leesylvania State Park of an eagle that was high up in a tree that I noticed as I was leaving the park. Naturally, I slammed on my breaks, whipped the car around, parked (poorly), grabbed my camera, and was fortuante enough to take a few shots before the eagle got nervous about me and flew off. I will be posting a more complete article later today with more eagle photos, as well as some sunrise photos. This entry was posted in Bird Photographs and tagged american birds, eagle, featured photographer. Bookmark the permalink. Congratulations, to an excellent photographer. An honor you are deserving!!! Congratulations! Loved seeing all the photos on the American Wild Bird site … they looked spectacular! Thank Anne and Ceasar–two of my biggest fans! Very cool. Enjoyed your story and pictures. I think you captured some of the bird’s personalities, and they remind me of someone I know! Really magnificent photos Steve, you just get better all the time. I’m forever amazed at your perfect timing.